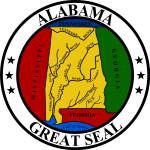 The 1980 United States Senate election in Alabama took place on November 4, 1980 alongside other elections to the United States Senate in other states as well as elections to the United States House of Representatives and various state and local elections. Incumbent Democratic U.S. Senator Donald Stewart decided to run for his second term, but was defeated in the primary. In November, Republican Jeremiah Denton defeated Democrat Jim Folsom. This page was last edited on 22 March 2019, at 03:10 (UTC).